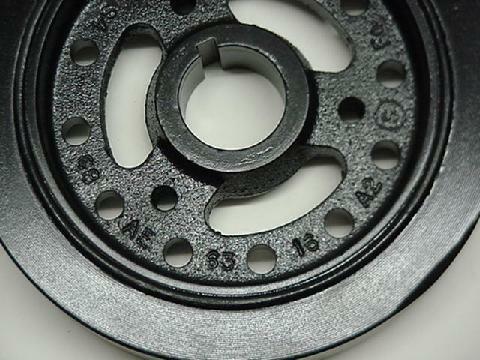 Ford harmonic balancers, or crankshaft vibration dampers, are identified by basic part number 6316. A harmonic balancer (or just "balancer") is a heavy, circular device mounted on the snout of the crankshaft to help balance the engine's reciprocating assembly. 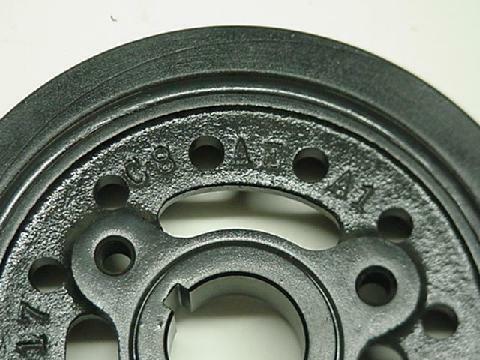 OEM balancers are constructed of a cast iron hub and a steel outer timing ring with a layer of vulcanized rubber between the hub and ring. The hub is keyed for proper location when mounting on a crank, ensuring that the timing marks present on the ring line up where they're supposed to be. The front of the hub has three mounting holes to secure the crankshaft pulley. The correct original color is semi-gloss black. 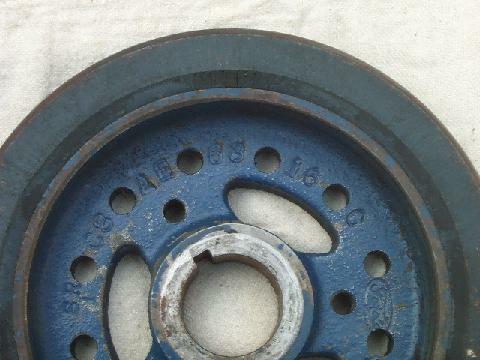 The 428 CJ and 428 SCJ used different balancers, each of which can be identified by the engineering number found on the hub. 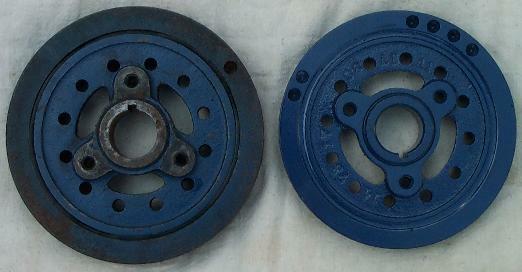 When compared side-by-side, the SCJ balancer is obviously wider and thicker than the CJ balancer. Interestingly, the 428 CJ balancer was also used on 390 and standard 428 FE engines. Thanks to Jim Kruse for letting me borrow his SCJ balancer for these pictures. 428 CJ C8AE-A1, A2 7" 1.125"
428 SCJ C8AE-C 7.5" 1.5"
I've also received reports of 428 CJ balancers with engineering numbers C8AE-AA and C8AE-AB, but I haven't personally seen one of these balancers -- have you? If so, please consider sharing a picture. The timing ring on the 428 CJ balancer has timing marks from 10 degrees after top-dead center (ATC) to 30 degrees before top-dead center (BTC). The SCJ balancer has timing marks from 10 degrees ATC to 46 degrees BTC. A letter-digit date code, such as "B8" for February 1968 or "K8" for October 1968, is present just to the right of the "BTC" mark. 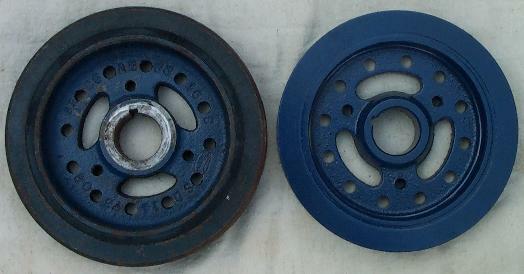 If you have an original balancer that you'd just hate to toss, know that they can be rebuilt and made better than new! See the registry forum (registration required) for details.